The richest, most non-traditional way to serve eggnog! 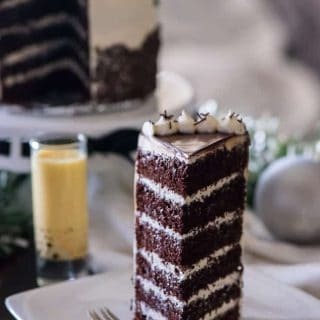 This Spiced Chocolate Eggnog Cake is infused with the holiday drink and then covered in the creamiest eggnog buttercream you’ll ever eat. Tell me why why whyyyyyyy people don’t put chocolate and eggnog together more often! Pairing it with vanilla is super versatile and traditional, but hook it up with chocolate? Oh hot damn. I want you to do something for me. 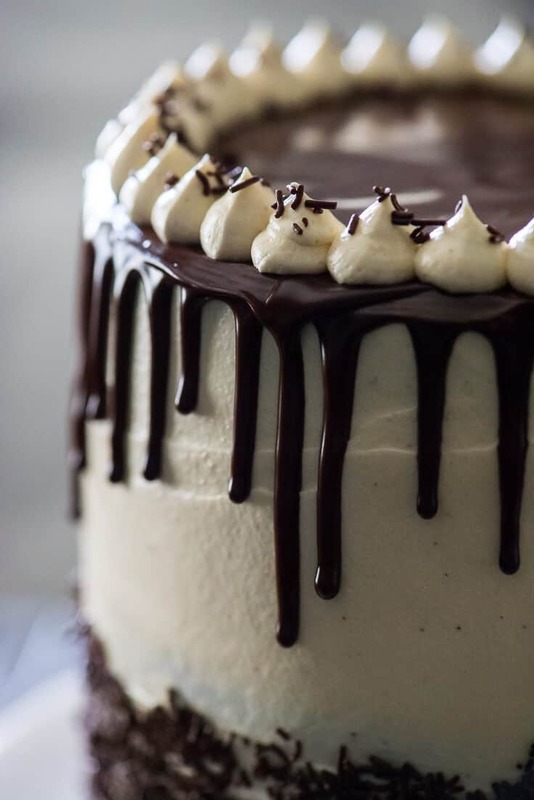 Scroll this post as if you’re asleep, and this cake is all you can dream about. There is truly something hazy and ethereal about this cake. I promise that, with your first bite, your eyes are gonna close and there’s bound to be all kinds of happy noises coming from your chocolate and eggnog-filled mouth. 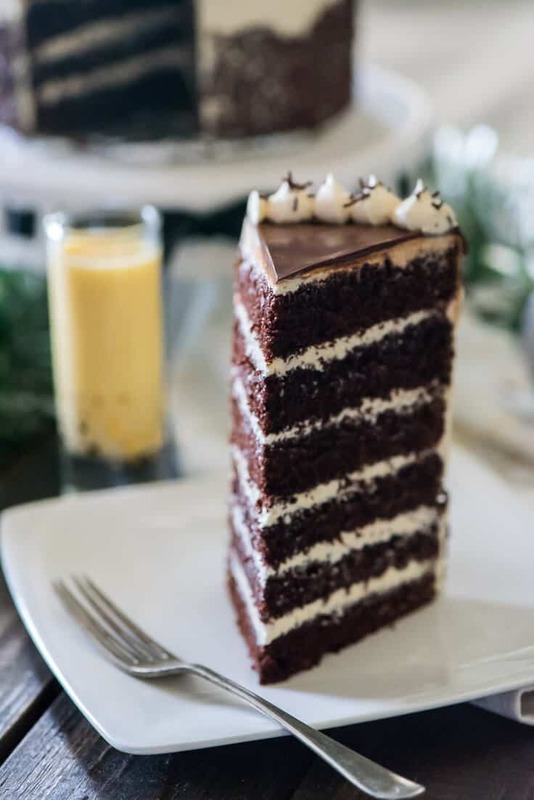 JUST TAKE ME TO THE SPICED CHOCOLATE EGGNOG CAKE ALREADY! 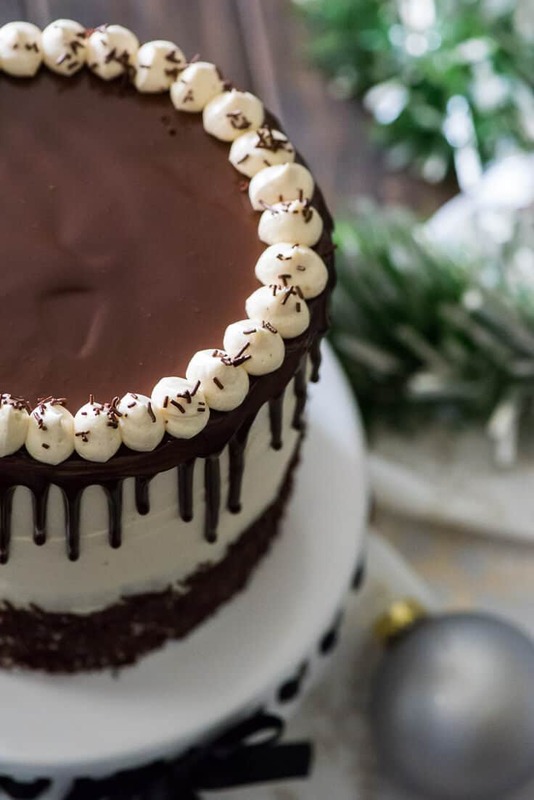 If you’d rather skip my (pretty darn helpful) tips and tricks, essential cooking info, and similar recipe ideas – and get straight to this deliciously easy chocolate eggnog cake recipe, just scroll right on down to the bottom of the page where you can find the printable recipe card! It’s been quite a while since I had a really good chocolate cake. I mean the really dark, rich, died-and-gone-to-food-heaven kind of good. Chocolate cake was once my all-time favorite food; and this was well beyond my formative years. I was a full-blown adult, scouring the dessert menu at every restaurant I went to, hoping for some sort of slice of decadence to sink my teeth into after my meal. It’s crazy how there are folks with proverbial second stomachs, made only for sweets. No matter how much they eat for dinner, they somehow always have room for at least a bite or two of cake or pie and ice cream. I would know…since I’m one of those people. A meal is just not a meal to me without something sweet to end it on. I suppose I got that from my Nana. Even though there wasn’t always cake or pie in the house to eat after dinner, there was an endless supply of ice cream, jello, or pudding to eat while watching TGIF. Or the news. Or David Letterman. There wasn’t a set schedule for sweets. As the holidays approached, the amount of goodies in the house always seemed to multiply. Suddenly, there were quick breads and pound cakes and all kinds of cookies to nibble on, as Nana put together her tins of holiday goodies she used to send out to her kids and grandkids. It was so nice to have first dibs, and there’s no doubt in my mind that that’s where my love of sweets stems from. I think she would be proud of how I hold on to the traditions she had. Maybe even more so after she tried some of my creations! Her cakes were usually much simpler (looking) than mine, but as a blogger, I have to make sure my goodies are dressed to impress. Clearly, this easy/laziness didn’t happen, and here I am with another showstopper. You can blame the buttercream, but don’t be upset at it for too long. Here’s the thing: when you make it, you won’t be able to stay angry. And you won’t be able to stop eating it, either. I am super set in my ways when it comes to some things, and will not sacrifice quality for cost. I buy one of the most expensive orange juices on the market because it’s incredibly delicious and fresh. I pay to have my home sprayed for pests because I can’t stand bugs. I also always always make that American powdered sugar buttercream, because I am stubborn and it’s a fan favorite. Funny enough, buttercream isn’t really even my favorite frosting. I have been known, from time to time, make lots of cream cheese frosting, and a Swiss Meringue here and there. Most of the time, I find buttercream way too sweet without something to cut into the sugar a bit. Sounds fancy, but it’s probably closer to the stuff your grandmother made. It’s a flour-based frosting that starts with a pudding base cooked on the stove. I know, I know. Cooked icing? Just hear me out. This buttercream is easily my new favorite thing. 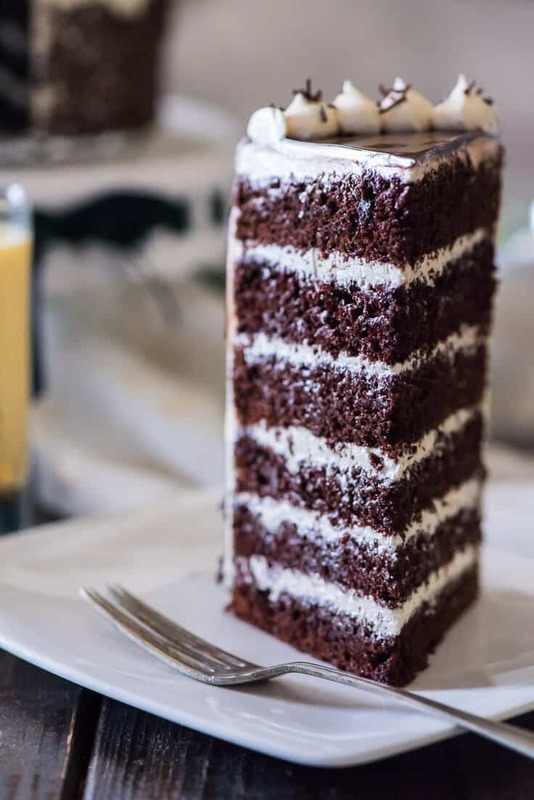 It’s incredibly soft and tender and fluffy, but still holds up between cake layers, as well as in piped shapes. And it’s also not super-duper toothache-sweet, either. And then there’s the fact that this cake is everything eggnog, too. I promise, even eggnog haters will L-O-V-E this cake! The richest, most non-traditional way to serve eggnog! 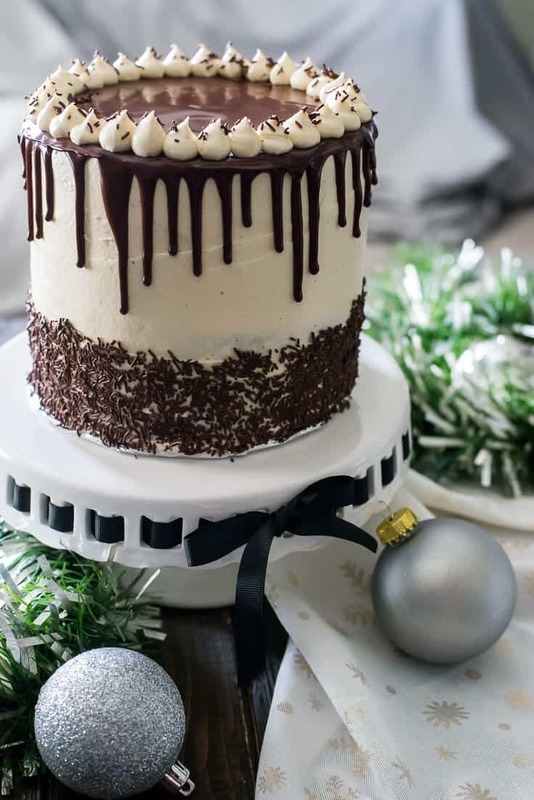 This Spiced Chocolate Eggnog Cake is infused with the holiday drink and then covered in the creamiest eggnog buttercream you'll ever eat. Preheat oven to 350 degrees. Line three 6-inch cake pans with parchment rounds, then coat with baking spray. Set aside. In a large bowl, combine all dry ingredients and whisk until blended. With a spoon, create a well in the middle. Add eggs, eggnog, vegetable oil, and vanilla and stir until combined. Scrape down the sides of the bowl and add the boiling water. Whisk until well combined. Divide batter evenly between the three cake pans and bake for 30-35 minutes, or until a toothpick inserted comes out clean, with only a few crumbs. Allow cakes to cool in pans for 5 minutes, then remove to cooling rack to cool completely. In a medium saucepan, whisk together sugar, flour, and nutmeg until well blended. Place saucepan on stove over medium heat and, while whisking, add in eggnog. Whisk until no lumps remain. When it's almost ready, add rum and vanilla and whip until incorporated. Reserve ¾ cup buttercream in a pastry bag. 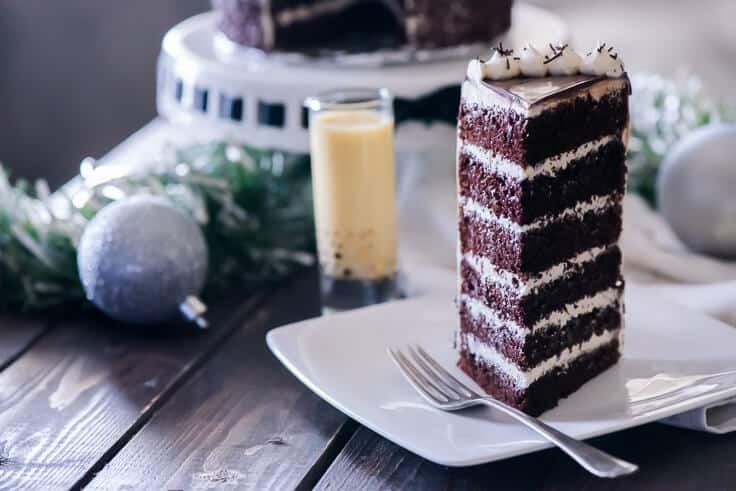 Using a sharp serrated knife, carefully slice any domed tops off of each cooled cake layer, then slice each layer in half horizontally. Place a layer on a cake board or plate and, using an offset spatula, fill and spread 1/4 to 1/3 cup buttercream to cover layer. Repeat with remaining layers, then chill for 30 minutes in the fridge. Use the remaining buttercream to cover the top and outside of the cake. Garnish bottom half with chocolate sprinkles, then store cake in fridge until ready to serve. In a small saucepan, bring heavy cream to a bare simmer over medium heat. Place chocolate chips in a bowl, then pour hot cream over. Allow to sit 4-5 minutes, then whisk from the middle outward until chips are melted and blended, and ganache is dark brown and shiny. Allow to cool 15 minutes, then remove cake from fridge. 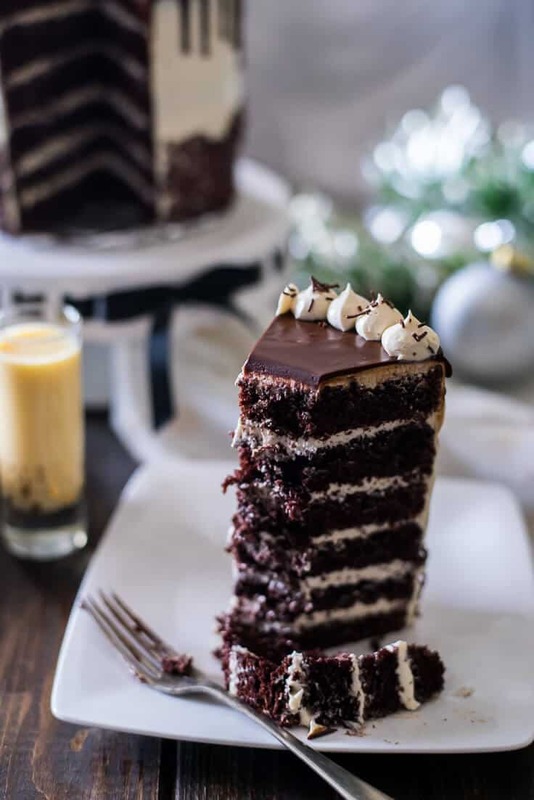 Pour desired amount of ganache on top of cake and, using an offset spatula, spread it to the edges and allow to drip down the sides. Top cake off with dollops of reserved buttercream and additional chocolate sprinkles. Enjoy! 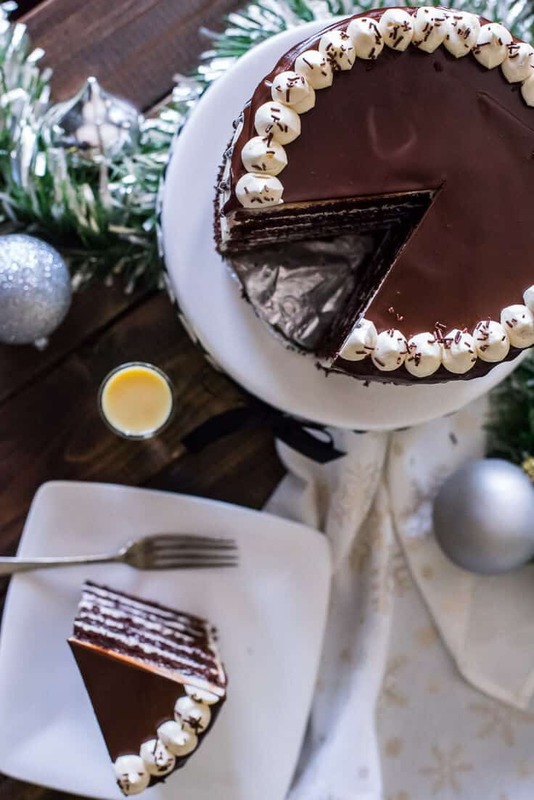 PIN THIS SPICED CHOCOLATE EGGNOG CAKE FOR LATER! This Sunday Supper is bursting with holiday dessert goodness! Take a look below and find a favorite! That is just absolutely gorgeous! You are such a talented baker. Oh my, what an amazing looking cake, and so perfectly sliced and iced as well! Yasss! And you are a Super Genius to have made ermine with Eggnog! You’re the queen! This is the best excuse ever to buy eggnog!!! Amen, Liz!!! And whatever is left in the carton helps wash the cake down quite nicely! O M G!!!! I don’t know if I am VERY sad that I don’t live near your or VERY thankful because I would not stop eating this cake!! Go with sad, Betsy, because we would have so many fun adventures living in the same place!! This looks beautiful and awesome. But, I think I’m missing something in the steps. You beat the butter and sugar. When do you add them? I don’t see that step. Your Nona must have been a wonderful person, then! <3 Thanks for coming by, and for the pin!! Darn it! 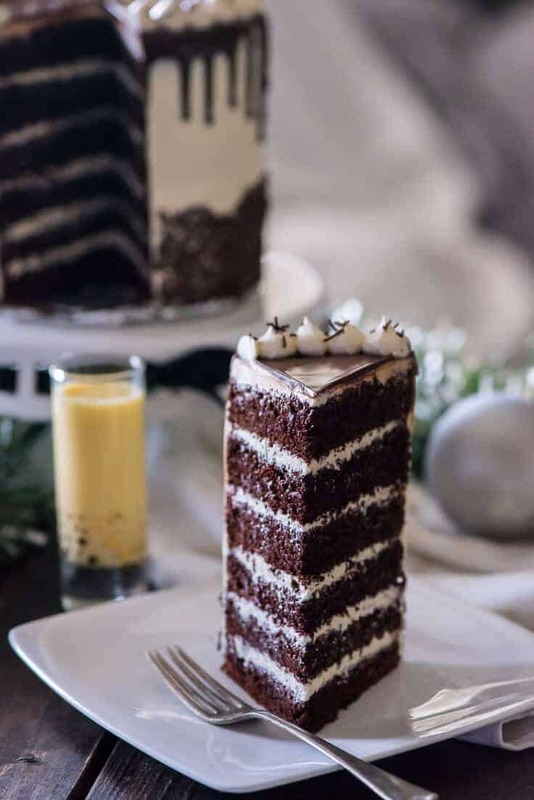 I do NOT need another cake on my “to bake” holiday list but how can I resist this one? I love that you combined chocolate and eggnog! Plus, it looks gorgeous! Girl, if you’re gonna bake anything for the holidays, this HAS to be on the list! You won’t regret it! where to buy eggnog? i don’t think it’s available here in my country..do you have a recipe on how to do it?